It is a line that will be echoed, almost defensively, by the adult Richard later in the play. This interposed opening functions as an ironic or poignant preamble to what unfolds. Charles Edwards assumes the role of the eponymous king. He is a fascinating Richard, growing into the part as the evening progresses. Edwards is, by turns: flighty, bemused, impassioned, forceful, melancholy and effete, yet he never settles into one specific mode (as some Richards can) but alternates between them with a lightness and intelligence. His deposition-crown scene with David Sturzaker’s Bolingbroke is a highlight. This was a complex Richard, not completely complacent or unworldly but with a profound sense of his own divine importance; a Richard who is both tentatively capable of political machination (his implied complicity in Gloucester’s murder) as well as with lifting off into lyrical flights of fancy. Edwards unspools his lines of pentameter with admirable clarity. Paul Wills’ set immediately calls to mind that masterpiece of European devotional art: the Wilton diptych, a depiction of a kneeling Richard II before the Virgin and Child– all deep blues and glistering gold. The all gold set and blue flags, which adorn the surrounding auditorium, are a striking visual quotation. The flags themselves are embossed with Richard’s heraldic crest, which also appears in the Wilton, and is heavy with symbolic and metaphoric significance: a white stag gorged or ensnared with a golden crown. 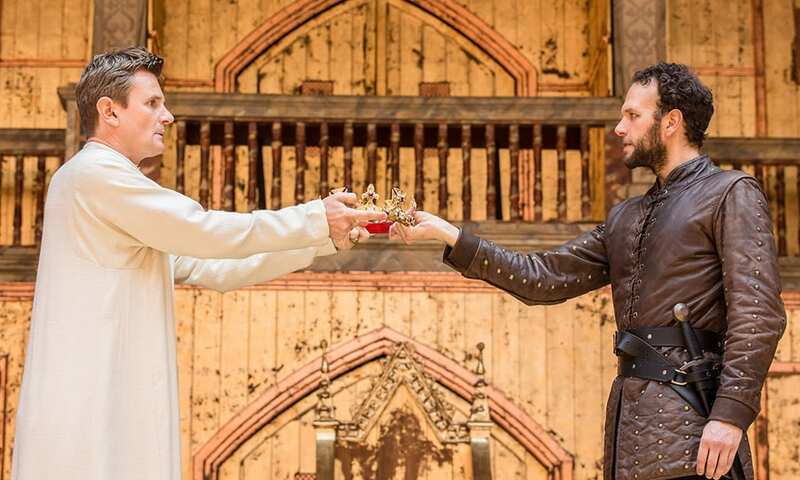 The image sums up one of the play’s central concerns, a king’s fraught relationship with power and office – also raising a corollary question: what is superadded to the man which makes him a king? And how do you lose your kingly status? The traditional setting of the Globe proves a particularly appropriate venue for the play and such monarchic questions. What’s more, Richard II has never been particularly amenable to modernisation as it already contains such a striking internal iconography. Wills’ simple yet distinctive set design combined with Simon Godwin’s fluent staging allows the audience a close to direct connection with the evocative language, to my mind some of the most beautiful (and self-consciously lyrical) passages that Shakespeare ever wrote. There are strong performances from the entire cast, surrounding Richard is a sycophantic coterie of “yes men” who grin like hyenas at the King. Gradually, they are brought low or prove their disloyalty (with one particularly significant dramatic alteration at the denouement). Costume design is also quietly effective throughout, demarcating Richard’s difference from the others, as well as illustrating the division between the courtly and warrior classes (represented by Bolingbroke). My only criticism is that an interpretative earnestness pervades the production; Oliver Boot’s Mowbray appears genuinely shocked and moved by the accusation of murder at the start. Similarly, Bolingbroke is truly sad at Richard’s demise. Overall, an exploration of realpolitik was largely sacrificed in favour of personal and psychological emphases. And, very occasionally, this same personal earnestness threatened bathos. Director Godwin perhaps recognised this possibility because the Aumerle, Duke and Duchess of York treasonous subplot was played as glorious farce, reinvigorating the performance with a second wind of lightness and energy—and yielding excellent performances from William Chubb’s vocally virtuosic Duke and Sarah Woodward’s vigorous Duchess. Stephen Warbeck’s brass underscoring was also largely used to good brooding effect. In a couple of places, however, it did threaten to prompt the audience’s emotional response rather than merely reflect it. Nevertheless, this is a production commendable for its depiction of both light and shade, and the vagaries of the human condition. 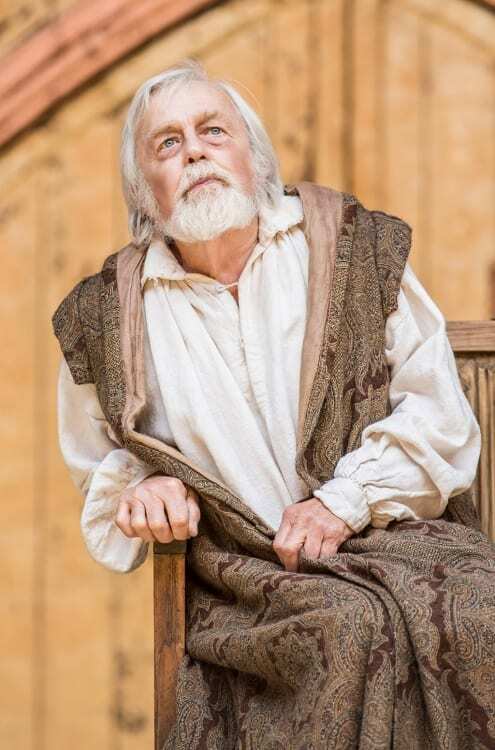 By the end of the play, Edwards’ Richard is just a man; the cocky self-assurance is gone— his Lear-like transformation from king to commoner is almost complete. Overall, a consummate and pacy production of Richard II; a triumph of performance and direction; a pleasure from start to stop.